Would you let a Plumber build your new Req room? I hope not! 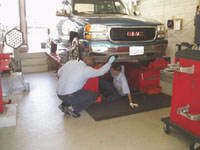 Don't just any old shop align your vehicle, or fix your Shocks, Struts, and Brakes. Let the professionals here at Bagge and Son perform the work. WIth over 32 years of experience Tom and his team of technicians will make sure your vehicle drives straight as an arrow. Your brakes will stop you the right way and you can also have that comfortable soft ride with your new suspension. 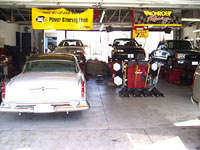 These services are very important to keep your car running in tip top shape. 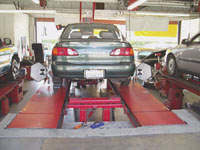 We have the latest alignment tools and equipment, we have reliable good older alignment machine all the way to the brand new alignment machines. So we can work on CLASSICS, TRUCKS, and Cars all makes and models. 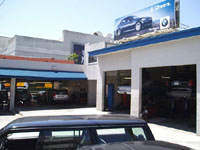 We have been serving Culver City since 1918 and plan on providing the same honest, trustworthy service for many more years to come. We have a professional environment and a great attention to detail. We have built a name of integrity and trust among our peers, that is why they turn to us for their Alignment, Brakes and Suspension needs. We strive for the best and will continue to work with our peers to provide you with the best service we can. We have worked on vehicles for the FBI and the Limo for the Secret Service. 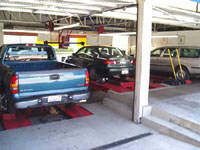 You can trust us to get the job right the first time every time and you will be satisfied. You mean very much to us and our staff and look forward to hearing from you in the near future. Copyright © Bagge and Son 2001-2010 All Logos®, Trademarks™ and Copyrights© are property of their respective owners. All car pictures displayed are for the sole purpose of depicting the type car the shop specializes on and they were obtained from public domain.